← What’s Good About Our Sheep? It is hot. Not a breath of wind and the grass crackles and breaks up beneath your feet. Hot air feels heavy, leaves hang listlessly off the gum trees. We hear it is the hottest day or the hottest week on record. It sounds as though it’s never been hotter. 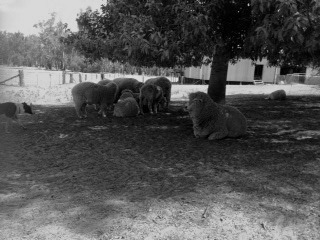 Sheep go for the shade and don’t move. All day. They provide shade for each other, too, pushing their heads into another flank or under the chin. I wonder if they take turns. They lean into the trunk of the tree, as though it is an icepack. It would be too, with all that green sap running up and down. Imagine it’s 1858 and you’ve just arrived here in Narrandera. March is cold with flooding and storms – where you’ve come from. Where’s the winter? Now it’s so hot. And you are chopping wood and digging holes and making fences. building your house. Maybe you don’t feel all that hungry. Thank God for the Murrumbidgee River where you can drink and wash and swim. Can you swim? You are certainly going to drink the water. No fridges, no fly screens, no air conditioning. No roads. No trains here. Ah, but the first paddle steamers are coming round the corner, you can go to Adelaide or Melbourne. The Murrumbidgee was always filled by the melting snows of the Snowy Mountains and that was the time you could use it. You had that window of opportunity to get your wool, securely tied to the long barges, to Melbourne. That was in the spring, September and October and November. But now its March, today you go straight for the shade of the huge gums and wonder how much longer… I take my hat off to them. I left out a bowl of potato chips yesterday. Last night I went to throw them out. They were crisper than they’d been in the morning. That’s how hot it is. Today is International Woman’s Day. I went to work this morning and had a chair and table set out for me under a pepper tree with it’s lovely pink peppery seeds. All the records and sheep information ready in front of me, as we weighed and classed our young rams. I really enjoy being a woman. This entry was posted in Uncategorized and tagged History Murrumbidgee River, International Women's Day, Narrandera, sheep rearing. Bookmark the permalink.